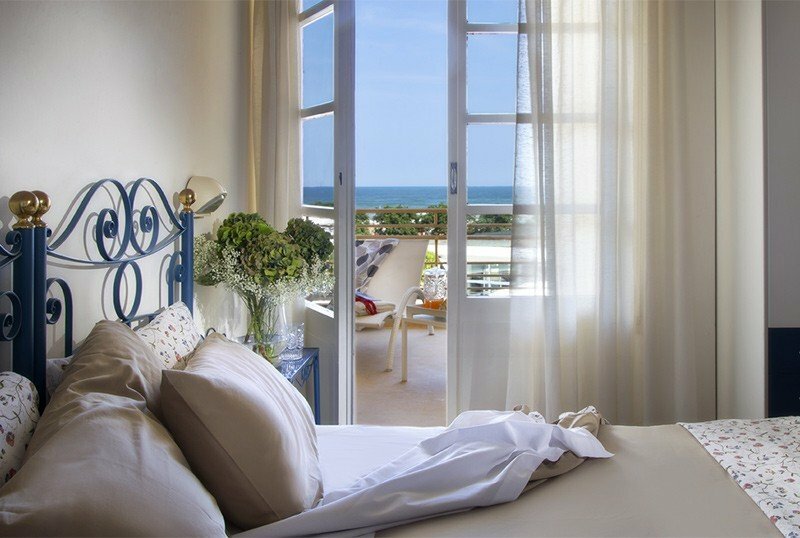 Hotel Zara is a 2-star family-run hotel in Riccione, housed in an old restored villa. It offers numerous services for families with children and sports enthusiasts. The structure adheres to the AIC (Italian celiac association) and offers menus dedicated to celiac guests. Allowed animals of all sizes. The structure is located in Riccione, a few steps from the beach and the new pedestrian promenade, a five minute walk from Viale Ceccarini. All rooms have a balcony (also with sea view), recently renovated private bathroom with shower, hairdryer and bathrobe, safe, telephone, satellite TV and air conditioning. WITH VERANDA : to the services already present in the other rooms is added a large open-air porch (also with sea view) with relaxation area, tea corner, minibar and TV sat 40 ". Terrace, two open-air porchs, bar, elevator, newspapers for common use, free use of bicycles, welcome drinks, theme nights, entertainment with Sunday aperitifs, Nutella party and dancing parties, herbal tea and tea time corner. Available equipment for beach Nordic walking. For a fee: beautician, physiotherapist, personal trainer, dietician, massages. PARKING: uncovered and covered, both on request. Available for everyone. CONVENTIONS : beach, amusement parks, discos, swimming pool, spa. Possibility of organized excursions. SERVICES FOR DISABLED: entrance with inclined ramp, lift for disabled people, ground floor room with wheelchair maneuvering space, bathroom with accessible shower and special chair. BREAKFAST : international buffet breakfast with homemade desserts also without gluten. LUNCH AND DINNER : choice between 2 menus of meat and fish, buffet of vegetables and desserts. Pasta and homemade desserts, also for people with celiac disease, with particular care in the choice of ingredients. VARIATIONS : cuisine prepared for celiac, lactose-free menu and vegetarian dishes. Vegan cuisine on request. OTHER: themed dinners, aperitifs and birthdays with cakes also without gluten. In the hotel : welcome gift, strollers, outdoor playground area, baby / mini / junior club, live entertainment, bottle warmer. On request baby sitter and pediatrician. In the room : cots, bed rails, night light, toilet reducer, baby bath. At meals : table seats, flexible hours, saucers and cuttings, baby menu and baby food. Snack corner with snacks also without gluten. On the beach : children's pool, two playground areas, entertainment, swimming lessons (for a fee). Hotel Zara has an agreement with the Spiaggia del Sole, Bagni n. 81, 86 and 87. Among the services available: two swimming pools with heated water for adults and children, four beach tennis courts and beach volleyball, basketball court, bocce, ping-pong, table football, soccer, two playgrounds for children and entertainment, relaxation area with magazines, chess and checkers. For a fee two hot tubs, pedal boats and skates. Prices are per day per person full board, for a stay min. Three days. - The reservation is binding only after payment of a deposit of Euro 300.00 that can be sent by bank transfer or postal order. - For early departures the penalty will be quantified with the payment of 3 missed overnight stays. Super offer Easter and Bridges. 7 days in All Inclusive treatment, in standard room, starting from € 43.00 per person per day. Contact us to book your holiday or for more information. For bookings before March 31st -5%. The offer is reserved for a limited number of rooms.